- is a Mental Health Organisation which helps people who have suffered, or are suffering, from mental health problems. Members are helped to recover from all forms of mental breakdown, or indeed, to prevent such happening. 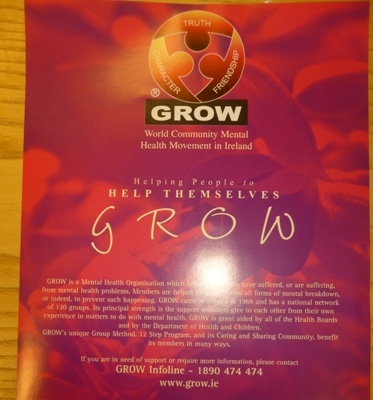 GROW, founded in Australia in 1957 by former mental sufferers, has a national network of over 130 Groups in Ireland. Its principal strength is the support members give each other from their own experience in matters to do with mental health. - is a programme run for those who have suffered the loss of their spouse/partner by seperation/divorce or death. - this support group offers family and carers an opportunity to meet others and access information and practical advice in a welcoming and supportive environment.